TRIPLE ‘N’ ZONE (Naitasiri, Nausori and Nasinu zones) – ADI Cakobau School and Lelean Memorial School won the girls’ and boys’ divisions of the Triple N Zone held at the ANZ Stadium in Suva yesterday. In the girls’ category, ACS had 30 gold, 19 silver and four bronze to take the overall title. Wainimala was second with two gold, four silver and five bronze while Sila in third place with one gold, six silver and eight bronze. In the boys’ division, LMS had 25 gold, 17 silver and 19 bronze, in second place Sila Central had 10 gold, 10 silver and seven bronze. NADI ZONE – NADI Muslim College pulled off surprise results to move to the top of the overall medal standings after day one of competition at the Coca Cola Nadi Zone at Prince Charles Park. Nadi Muslim collected 10 gold, 3 silver and 4 bronze medals. Korovuto College was close behind with 9 gold, 8 silver and 8 bronze medals. Ratu Navula was third with 7 gold, 5 silver and 8 bronze medals. Nadi Zone delegate Atish Lal said they expect stiffer competition today. NADROGA/NAVOSA ZONE – AFTER Day One of the Nadroga/Navosa Zone Cuvu College leads the boys’ medals tally with 7 Gold, 4 Silver while St Theresa College formerly known as Bemana College tops the girls’ competition with 5 Gold, 4 Silver and 3 Bronze. The two-day competition started today at Lawaqa Park in Sigatoka. Last year’s defending champion, Sigatoka Andhra Sangam College is in second place in the boys’ division with 4 Gold, 5 Silver and 3 Bronze. Sigatoka Methodist College is in third place in the boys’ division with 4 Gold, 4 Silver and 5 Bronze while Nadroga/Navosa Provincial High School is placed third in the girls’ medal tally with 3 Gold, 3 Silver and 1 Bronze. 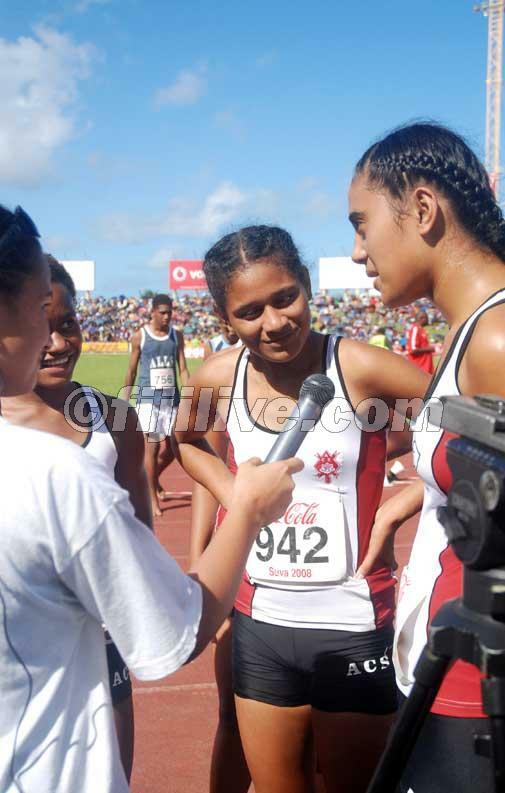 Coca Cola Games girls division defending champions, Jasper Williams High School is leading the girls division medal tally of the Lautoka Athletics Zone with two gold medals. Natabua High School is in second place with a silver. Natabua is leading the boys division medal tally with five gold and two silver while Vishnu Deo Memorial School is in second place with a silver and a bronze medal. Five records of the Lautoka Zone have also been broken. Meanwhile, 3 zone records have been broken at the Nadi Zone. Votualevu College student Penaisia Finau broke the sub junior girls high jump with a jump of 1.31 metres, SVC’s Rusiate Vakaloloma broke the junior boys shot put record with a throw of 11.98 metres while Susana Rokoua of Korovuto College broke the intermediate girls discus zone record with a throw of 23.5 metres. We’ll bring you more updates in Day 2 of the Western Zones meet. ← Pawpaw and pineapple with lime syrup…yum! !